Abstract : "For general input affine nonlinear systems, robust reliable control designs are commonly available that compensate the actuator faults in pure outage mode. In this paper, a more general and complex problem is considered and an adaptive reliable H∞ controller is designed for a class of uncertain input affine nonlinear systems in the presence of actuators fault. The key element of the work is the introduction of a novel adaptive mechanism that estimates the faults which are modeled as an outage or loss of effectiveness and stabilizes the overall system. Incorporating with the parameter projection algorithm and the solution of Hamilton-Jacobi-Inequality (HJI), the proposed method combines adaptive reliable control and robust H∞ control techniques. A numerical approach is developed based on the Taylor series expansion for solving the HJI. Various simulation examples are given to illustrate the effectiveness of the proposed adaptive reliable H∞ control scheme over the conventional H∞ control and reliable H∞ control method. " 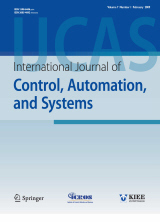 Keyword : Adaptive control, H∞ control, Hamilton-Jacobi-inequality, HJI, reliable control systems.